• Are you a fisherman? Or someone who simply wants to hit the Caribbean seas for the chance to catch the big one?If so, look no further than Caribbean Dream's Fishing Excursion!Punta Cana is a renowned destination for Deep Sea Sport FishingYear round, there's prized game fish to reel in...This is what YOU can land! 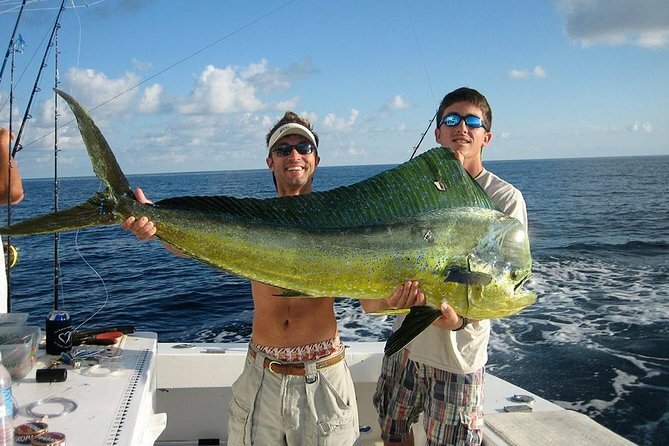 • Mahi Mahi - Known locally as Dorado, this tropical fish is recognized world wide for its meat. At up to 7 feet and over 80 pounds, you're gonna have to work for the chance to taste! • Wahoo - Living in Tropical seas and part of the mackerel family, Wahoos are long, sleek fish with average weights of 20-40 pounds. Fun to catch and even better to eat! • Yellow Fin Tuna - A common fish in temperate latitudes, you can possibly land one at over 7 feet and over 400 pounds! Delicious meat often used in Sushi. • Sailfish - The fastest fish on earth is caught regularly in Punta Cana. Size can be over 6 feet and over 200 pounds. Fast and big! • White Marlin - Smaller than their relative, white marlin can measure up to 10 feet and well over 150 pounds. Not small! But the meat is incredibly tasty. • Barracuda - A formidable looking fish up to 6 feet in length and up to 100 pounds. Great meat and a fun catch. • Blue Marlin - The grand prize! Weighing over 1,000 pounds and up to 16 feet in length, the blue marlin is considered a delicacy.